How well would you do in Richard's Lazy Sunday Tree Quiz? 1. The scientific study of plant life is known as what? 2. A Thousand Trees was a single by which Welsh rock band? 3. In which county is England's largest forest? 4. Which tree's leaves are the symbol of The National Trust? 5. The love apple is the original name for what? 6. What trees are considered the tallest growing trees in the world? 7. Which fruit or nut listed below comes from a tree? 8. What tree is particularly associated with Buddha? 9. Which football team is nicknamed the Cherries, after their stadium was built on a cherry tree orchard? 10. Which famous children's book was written by Shel Silverstein? 11. What was the tree in the Garden of Eden called? 12. Which tree do goats famously climb in Morocco to eat the fruit that they grow? 13. The Womping Willow is a tree from which series of books? 14. The leaf of what tree adorns the Canadian flag? 15. Amber is made from fossilized tree WHAT? 16. The Japanese word “sakura” means the blossoming of what kind of tree? 18. What evergreen tree bears the fruit from which chocolate is derived? 19. Arbor Day is a holiday in which individuals and groups are encouraged to plant and care for trees. It was reportedly first observed in which European country in 1594? 20. Family Tree is a documentary-style television comedy created by which comedian perhaps most famous for his role in This Is Spinal Tap? 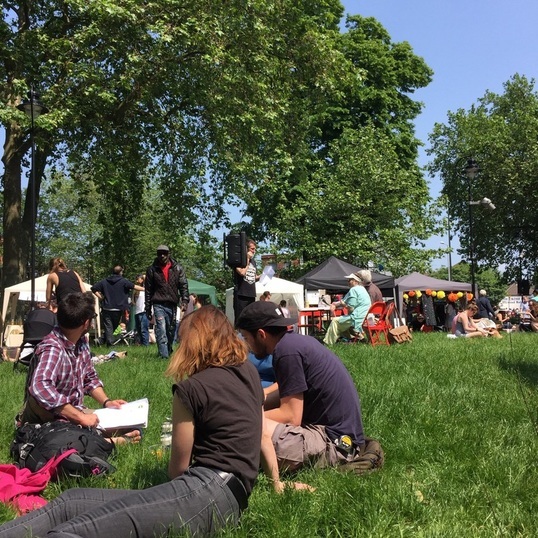 ​Richard (centre) running his tree themed quiz for London Tree Week on Tottenham Green, 5th June 2016.